I've had an idea of what I wanted his picture for the invitation to look like for awhile, and I knew part of it was a colorful highchair. So, I bought this old wooden one for $10 on Craigslist and spray painted it aqua. I l-o-v-e how it turned out, and it's perfect to use for his party too since he doesn't have an actual highchair (we use a booster on one of our bar stools). 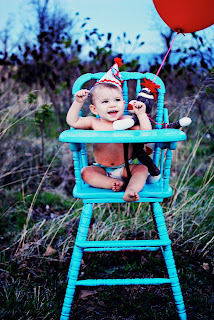 As I mentioned, his party is going to be a vintage sock monkey theme with a red and aqua color palette. I love buntings, so of course had to make one for his invite. I had pretty much finished the design, but then Katie posted this adorable invite by Sugar Paper that used an actual candle on the invite. I knew I had to put a 1 somewhere just so I could do that! 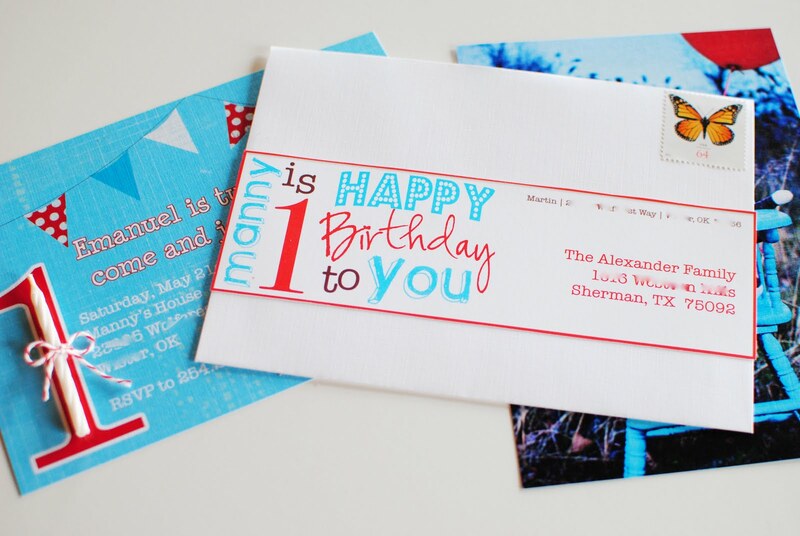 The envelopes were inspired by that same invitation design by Sugar Paper. I also made some sock monkey stickers to seal the envelope with, but I forgot to take a picture of those. Seriously could you have made a cuter invite??? First, the picture is so freaking adorable, love the bunting and the candle just finished it off perfectly!!! You may have to sell those!!! Love! so. 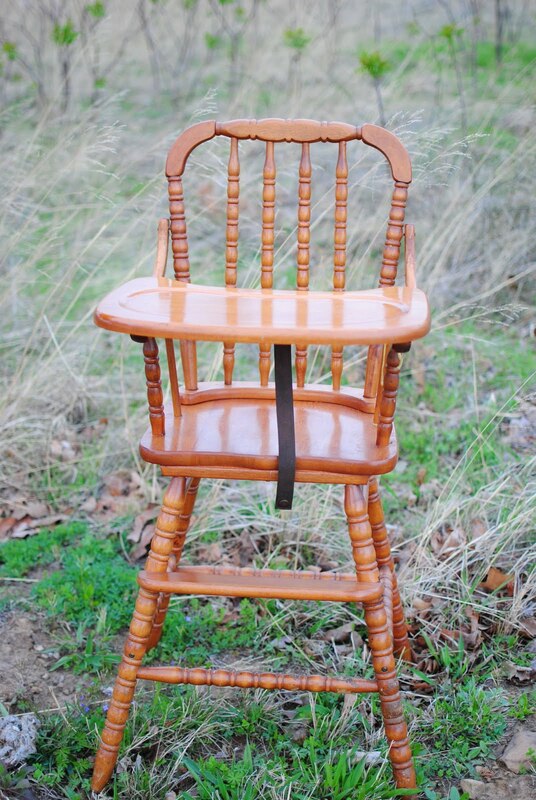 i totally don't have a baby anymore but if i did, i woudl so be going out to find an old highchair to paint! LOVE IT!!!!! did you sand down the chair before spraying? I am always so nervous about repainting something! ha! and. the invitations are FAB! im sure everything will come togther!!! besides, you have a few weeks yet before the party :) Happy planning! oh my goodness, he is so stinkin cute in his high chair! and the high chair transformation!!! it turned out great!!! LOOOOVVVVVVEEEE! LOVE, love, love! Can't wait to see everything else! LOVE the high chair! I've always wanted to do that!! Wish we lived closer so I could just borrow yours ;) hehe Happy Birthday big boy! Love it and I LOVE the highchair! oh, girl! I LOOOVE those colors together! the invites are simply fabulous! our boys will be celebrating on the same day, at the same time!!! when did our sweet babies grow up?!?! 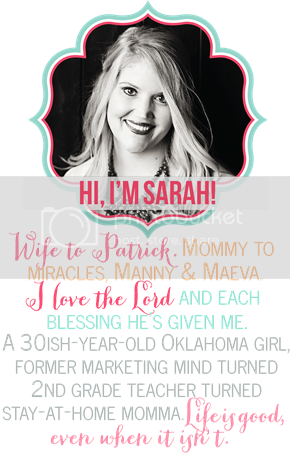 I LOVE those, Sarah. The high chair was a perfect touch. Brilliant! oh my goodness!!!! So, so, so cute! I love it all! wow those invites are amazing!! You did such a great job! And I LOVE the blue highchair. You are so creative! Those are just too cute for words! I can't wait to see his party pics! You rock! These invitations are just too cute!! I love the aqua and the red together! I can't WAIT to see pictures from his party. And I love the candle idea! That is so cute! That pic of Manny is so precious! Love what you did with the highchair & love the invitations, too! So glad Manny's birthday is before Emery's so I can get lots of ideas from you because I love love love your ideas...highchair...GENIUS!! :) Have fun party planning! Can't believe he is already ONE! The CUTENESS of it all! IT HURTS!!! I've got so much to say :) I adore the pic - the high chair is pure brilliance...as are the candle and address labels. And LASTLY :) I was in Party City today and saw some sock monkey supplies. I don't typically like the matchy-matchy stuff, but for my daughter's 1 birthday party, I'm doing licensed Peter Rabbit plates and cupcake decorations with solid blue/green/carrot everything else :) And what I can't find I'm just making myself! I AM DYING RIGHT NOW!!!!! OMG!! We found the same highchair (almost) and are painting it yellow!! I cannot believe it! Same type of field pictures. She has a handmade hat, and ALL. Great minds. Great minds. I swear. They are identical. Too funny :) I LOVE THEM! Sarah he is gorgeous. The invitations are so vivid and make me smile. Beautiful job! Thanks for coming by. You're always welcome. Sarah I LOVE it!! He is getting SO big! How stinkin' cute are these!!! Love the colors. Aww, Happy Birthday!!! I love the color choices. What an adorable party! I love the invitations....and the highchair is gorgeous! I love the old wood highchairs. I thought for sure it was a prop from a photographers collections! Great job! Love his invites! They are adorable! You got such sweet pics of him! Love the highchair too. There is one in Fort Smith on Craigslist right now that looks a lot like this for $25. I have been debating getting it and I think I'll for sure see if they still have it. The paint looks so good on it! The card and the highchair are so adorable! Oh man, now you're making me excited about planning my own boy's 1st birthday! Your invitations are darling! I can't wait to see pics of the party! 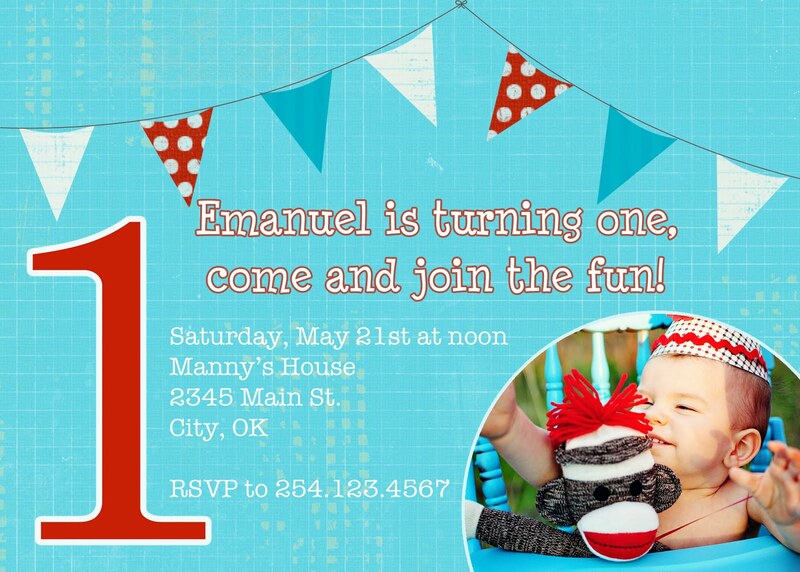 I love his invitations! He is just so adorable!! 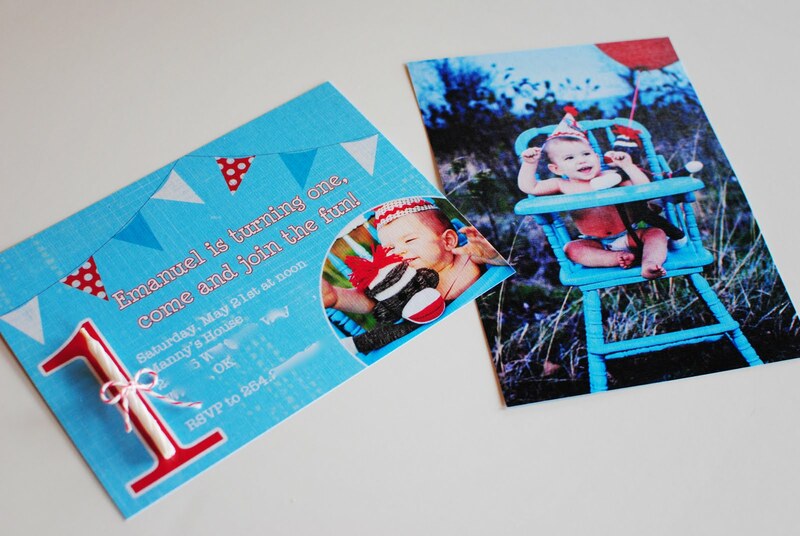 I love the invitation and highchair, you are so creative! Beyond adorable! The highchair turned out great too! Can't wait to see all the other amazing details you'll come up with! That invitation is sooo adorable! Almost as cute as Manny. :) I can't believe it's been a year already. I think I'd just started following your blog when you announced that you were expecting. What a joy to be able to follow your journey!